A feisty, well-built fighter of the new Libyan regime jumps to the ground from his pick-up truck as a Katyusha just misses and slams into the desert behind him. Shouts of "Allahu Akbar" (God is greatest) reverberate around him as seconds later he gets up and dusts off the sand from his clothing. "Allahu Akbar! That was close," says Omar Shukri as he picks up his sunglasses and puts them on, smiling and flashing a victory sign to his comrades. Shukri is one of dozens of fighters who have just entered the town of Harawa, 60 kilometres east of Sirte - the hometown of Moamer Kadhafi. The town has been captured by hundreds of Shukri's comrades overnight Sunday after fierce fighting with diehards of now fugitive Kadhafi. Hundreds of new Libyan fighters, armed with anti-aircraft guns, rocket-propelled grenades, Katyushas and backed by tanks, are slowly and steadily inching towards Sirte from the east to capture what is seen as the last major bastion of the former Libyan strongman. "We are making progress, but it is slow as resistance from the other side is strong," Mustafa bin Dardaf, one of the commanders of the Zintan Brigade, tells AFP. The brigade is crawling towards Sirte, intending to take Kadhafi's hometown "within days," says Dardaf, adding that the fall of Sirte will be "truly historic." 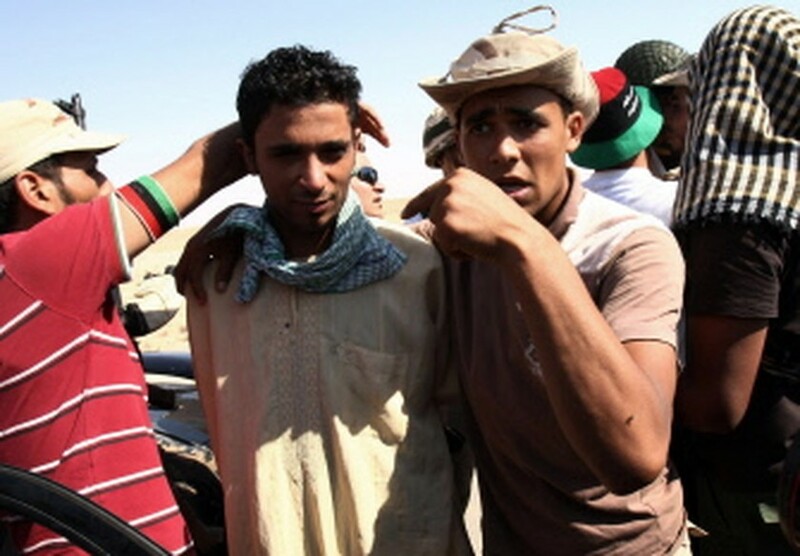 The fighters face fierce resistance from Kadhafi loyalists and moving forward is not easy. A steady barrage of machine-gun fire is heard as both sides attack each other just three kilometres (1.8 miles) ahead where the frontline lies. At regular intervals Katyusha rockets fly across from the other side and the fighters of the National Transitional Council (NTC) respond with a barrage of gunfire and rocket-propelled grenades. But the joy of taking Harawa is clearly evident among these young and old men who have turned fighters overnight, leaving behind years and years of stable jobs. "This is the dog Kadhafi," a young fighter says as he and other trample and a Kadhafi-era green flag and try to set it on fire with a cigarette lighters. After several attempts they succeed. Some fighters light their cigarettes with it as the cloth quickly turns into black ash. The youngsters dance around it, shouting "Allahu Akbar." A tall and skinny fighter climbs on the terrace of a deserted house in Harawa and pulls down another green flag, tears it up and throws it in a garbage bin below. His comrades cheer him on with more shouts of "Allahu Akbar." Bin Dardaf says his men have done well and are organised and have managed to keep the upper hand as they make their way to Sirte, taking village after village, house after house, without lose ground overnight to the loyalists. "Every village, every town we are taking, we are retaining," he says. But victory has not come easy. "Since morning today, we have had more than 20 fighters wounded, one of them seriously hit in the chest. But there is no death," Bin Dardaf says as he drives his Toyota pick-up on the road ahead, a signal to his men to follow him. A few metres away he stops and listens to the crackling radio. "Our fighters have now entered the town of Sultana and are searching for Kadhafi's men," he says. "This means that since morning we have advanced by almost 25 kilometres and we are now 38 kilometres away from Sirte," he says, revving the engine and setting course for the frontline. An ambulance, siren blazing, speeds by with a pick-up truck close behind it.